With spring finally upon us, our thoughts turn to freshening up the house and breathing new life into our humble abode. Aging takes a toll on all of us and as we get older, spring cleaning can take longer and some essential projects become off-limits and too difficult to accomplish alone. We want to remain independent for as long as possible, however, and this season presents the ideal opportunity to declutter, sanitise and revaluate the health and safety practicalities of our property to ensure a secure environment throughout 2016. While the deep clean is an annual necessity for all home dwellers, for the elderly, sprucing up the place can be a challenge. So how can we tackle cleaning tasks without exerting ourselves too much? Follow our guide to cleaning simply and effectively this spring. As you would for any big project or commitment, schedule your spring clean. Dedicating time to this task will ensure that when the time comes to start work, you’re prepared to take on the challenge. While you can pick and choose when to dust off certain rooms and go at your own pace, fixing a couple of days to take on the more strenuous jobs is a great way to ensure that where you need help, people are able to work this into their calendar and will turn up ready and raring to get stuck in. Where possible, enlist this help. Those later in life and possibly limited by reduced mobility or arthritic joints could well struggle to fulfil some of the necessary cleaning jobs. While it would be dangerous to attempt to balance on a ladder alone; family, friends or a professional domestic cleaner can take on these tasks securely. Carrying out your spring clean safely, will help to eliminate the risk of imbalance where this may be an issue for elderly homeowners. Bluebird Care, with its experience in providing homecare and live in care to older patients in the UK, has developed a Home Safety Checklist for avoiding hazards and preventing falls around the home. Asking for assistance when it comes to crucial housekeeping may feel limiting but realistically, while you’re unlikely to be able to dust the ceilings easily, there’s plenty of chores you can turn your attention too instead. Leave the heavy lifting to your willing helpers and be useful by sorting through paperwork or polishing silverware, which you can do effectively from the comfort of your rise recliner chair. While we all start out with good intentions when it comes to housekeeping, the purpose of the mission can get lost as the cleaning gets underway. Recognising the most important tasks that we’d like to accomplish before getting started can ensure that these remain the focus during your spring clean. Perhaps there’s a room that could do with some TLC or maybe the windows all need a good scrub down, put these at the top of your list and leave smaller jobs until the end. Make sure this list is available somewhere everyone involved can see and tick off tasks as they complete them. With your team of help assembled, make sure that everyone is aware of where their help would be best placed. Labour intensive jobs are better for the more agile, while you can be responsible for organising and decluttering. Now you have your master list for the spring clean, smaller lists devoted to individual areas in the house can help those cleaning in them to see what needs doing in that room. It’s worth taking note of the supplies you’re likely to need during the spring clean. This way you can stock up in advance and won’t waste money or time later. As a bonus you’ll also be sorting the cleaning cupboard in the process, so throw out expired products and replenish where needed. More than any other room in the house, it’s essential that the kitchen is sanitary. Along with the obvious health implications as the room where we prepare our meals, the kitchen is often a central hub for all household affairs including as a place where we tend to store important paperwork. As we get older, sorting through documents regarding life insurance and plans later on becomes an unavoidable responsibility and being able to access these papers at a moment’s notice is key. Over50choices help the elderly to get their affairs in order and ensure their wishes are seen too well in advance. When having a tidy up they suggest: “Our tip would be to ensure that things are stored within easy reach, not just for today but also tomorrow. Kitchen cabinets should be low so that where needed, the elderly can get to them. When spring cleaning, you ask whoever’s helping to replace frequently used items from higher shelves on to ones that will be more accessible. Take the time to also go through appliances and ensure that they are in good working order and are safe to continue using. If you have a microwave, it could be worth adding a sticky back transfer with larger print to make an easily readable keypad. Naturally, the kitchen will need sanitising. You could start by emptying the fridge and wiping down the exterior and all shelves and food storage compartments inside. Likewise, shelves, drawers and cabinets need cleaning and as in every room, employ a helper to dust those hard to reach corners and the ceiling. As the evening draws on, the bedroom is your sanctuary where you’ll go to catch up on that all important rest. It should be a safe place where you fall asleep without concern and with easy access to anything you may need during the night. Should you need to move about when its dark, appropriate lighting is a must. Check all bulbs during your spring clean and replace any that have burnt out or are too dim when it’s dark at night. You could have the opportunity to switch to energy saving bulbs, which will save on the household bills and help to promote a healthier environment. With bedrooms usually located on the second level of a house, those experiencing reduced mobility with age, could consider installing a stairlift to help them move with ease between floors and prevent accidents. It could also be beneficial to look into hand railings and lever-style door handles that will provide support and make accessibility around the home easier. If you have a spare mattress pad, the spring cleaning session is the perfect time to clean your usual pad and wash all bedding. This will eliminate any skin, dirt and sweat that naturally collects overtime to ward off disease-causing germs. Overtime, grime can gather in our bathrooms and this can make the surfaces and floors slippery – a result that could increase the risk of accidents. It is vital that soap scum and dirt is removed from the tiles, shower, bath and floor in the bathroom. To prevent the chances of falling further, you could install facilities that cater to the elderly. A walk in bath will make bathing easier for those who may have knee, hip or back complaints. You should also place a non-slip suction mat on the floor to make getting in and out of the bath tub safer. While you’re cleaning the bathroom, set aside some time to organise the medicine cabinet. Check expiration dates and remove any tablets, topical medicines and vitamins that are no longer in date. Keeping medicines in the house that the prescription is outdated on or you are no longer taking could be risky. They’re likely to have been exposed to moisture in the bathroom and sunlight so may not be fit for consumption anymore. Removing these medicines can also help to minimise the chances that you may accidently reach for the wrong treatment. Once you’ve assured that the hygiene of your home has been maintained, you could turn your attention to promoting a clean and safe environment for the rest of 2016. Many elderly people experience accidents in their own home because the house simply isn’t laid out to accommodate their situation. Age Action Alliance, an independent partnership of over 870 member organisations working together to improve the lives of older people, explains: “It’s a distressing fact that six people over 65 suffer a fall every minute. As around half of these occur at home, it’s a good idea to take a look around and see what can be done to lessen the risk. 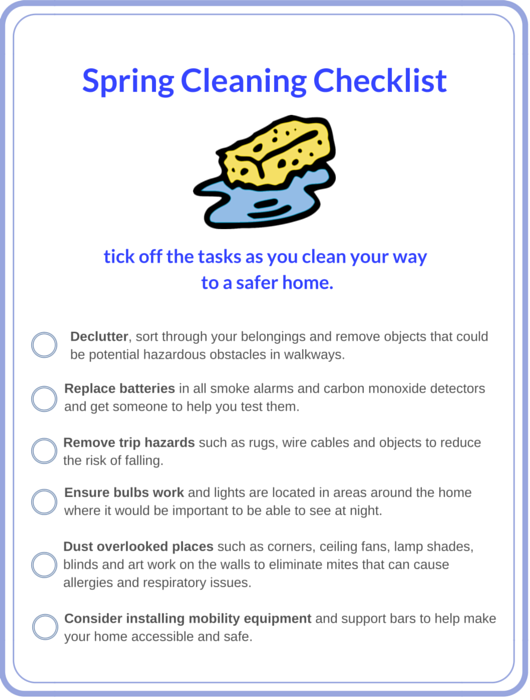 When you’re planning your spring clean, it’s worth creating a safety checklist with a few tips you can follow to make sure your home is a haven. Below you’ll find a simple checklist we’ve created with additional tips to refer back to during the clean. You can print it off and tick off the tasks as you go. Click here to print off your Spring Cleaning Checklist.